Popular cloud-storage and file-sharing service Dropbox announced earlier this year that it’d be ending its Public Folder option. These special folders allow Dropbox users to link directly to a file, without having to use a special URL generated by creating a sharable Dropbox link. The advantage of storing files in a Dropbox Public Folder is that users could easily link to those files thru third-party apps and services. But it’s likely that this function was misused by Dropbox users in ways that the service never really intended. This is a reminder that your Public folder links will become inactive on September 1. On that date, your Public folder will become a standard Dropbox folder, and your files will remain safe in your account. If you want to share those files again, you’ll need to use shared links instead. In the e-mail, Dropbox acknowledged that this change will be inconvenient for some users. Dropbox has created a support page to help users switch from sharing via the Public Folder to the standard method of sharing files thru Dropbox. Cloud storage and file sharing service Dropbox has become an integral tool for the freelance work I do. The service makes it incredibly easy to share large media files with clients. After using Dropbox since its early days, I finally upgraded to a Dropbox Pro account last year, as my needs began to outpace what the basic, free version had to offer. The name of your current plan, Dropbox Pro, is changing to Dropbox Plus. Don’t worry—the name is the only change we’re making. You’ll still get the same 1 TB of space and advanced features—like stress-free sharing and remote device wipe—at the same price. For more info, read the Dropbox Plus overview in our Help Center. Many Dropbox Pro users first used Dropbox Basic, our free plan. In the past, we’ve had users express confusion about the Pro plan name when upgrading. For example, some people assumed it was only intended for use at work. While there are some great additional features on Dropbox Pro, for many users the 1 TB of storage space is the most important feature, and the main reason they choose to upgrade. We simply updated the name to “Dropbox Plus” to better reflect that this plan offers more storage than Dropbox Basic, plus helpful sharing features. Dropbox has pointed out multiple times in these communications that this is a change in name only. Dropbox Plus users will continue to have access to all of the same features we’ve enjoyed under Dropbox Pro. For the most part, this name change appears to be for clarity and marketing purposes only. Disappointing news for people who are using Mailbox and/or Carousel. Dropbox has announced that they will be shutting down both products. Dropbox posted that they acquired Mailbox in 2013 because they believed in the way the product was making mobile email better. Dropbox launched Carousel as a new way to experience and share photos. The overall goal seems to be to extend the simplicity of Dropbox to other parts of user’s lives. It is that focus in simplification that has led to the decision to shut down Mailbox and Carousel. The Mailbox Blog states that when Mailbox joined the Dropbox team, it was intended to be the means to an end to solving the email problem. Dropbox has since realized “there’s only so much an email app can do to fundamentally fix email”. They now believe that the best way to improve people’s productivity is “to streamline the workflows that generate so much email in the first place.” Details about how Dropbox will be winding down Mailbox can be found on a Mailbox FAQ. The Carousel blog notes that “over the past year and a half, we’ve learned that the vast majority of our users prefer the convenience and simplicity of interacting with their photos directly inside of Dropbox”. It assures users that all of the photos that they have stored in their Carousel timeline will remain safe in their Dropbox where they always have been. They suggest you visit the Carousel Help Center for instruction about how to save photos you received through shared conversations or shared albums. 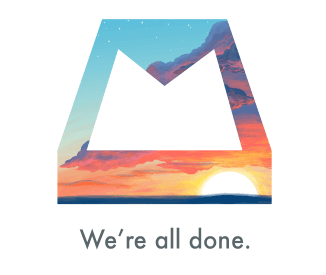 Mailbox will be shut down on February 26, 2016. Carousel will be shutdown on March 31, 2016. Dropbox will continue to communicate details directly with users of both apps in the coming days. Dropbox introduced something new that went into effect September 30, 2013. According to their blog, “all the screenshots you take can automatically be saved straight to your Dropbox”. It appears that the purpose is to give people a way to keep their computers a bit more organized. Instead of having screenshots on your desktop, for example, they can be stored in your Dropbox. It also gives people an easy way to share their screenshots. There is a step-by-step explanation that people can follow if they would like to begin storing screenshots in their Dropbox. I linked to the instructions for Mac. You can also get a “how-to” for WinXP or Vista/Win7. From now on, whenever you take a screenshot, the application will automatically save it to a folder named Screenshots in your Dropbox folder. It will also copy a link to the screenshot that you can immediately paste anywhere, such as an email message or Facebook post. Anyone who clicks on the link will see your screenshot on a preview page on the Dropbox website. In the same post, Dropbox also gives instructions about how to turn off the automatic saving of screenshots to your Dropbox folder. You can opt-out whenever you choose. In addition to using your Dropbox to store, and share, screenshots, there is another new feature for Mac users. You can now copy your entire iPhoto contents to your Dropbox. A new folder will be created for each of your iPhoto events. Who Can Access Your Dropbox Folders? A lot of people use Dropbox as a convenient way to transfer large files from one person’s computer to another. I find it to be extremely helpful for podcasters who need to send an audio file of their voice track to an editor who puts everything together. Today, I learned something rather unexpected about who, exactly, can see the files that are in my Dropbox. My husband and I are both podcasters. We have a podcast that we do together. I do a couple of other podcasts without him. He edits some of the podcasts that I do and some podcasts that I am not a part of. As such, both of us use Dropbox to move audio files around. The computer I use, and the one that my husband uses, are on a home network. He has admin level access to my computer. We find this to be helpful for many reasons – one being that it makes it easier for him to grab the audio file of my voice track for a podcast that he will be editing. Obviously, he and I are both aware that his admin status means that he can access anything on my computer. It turns out that the admin status also allows him to access my Dropbox. He discovered today that he can use his admin status to gain access to my computer and that it also allowed him to access my Dropbox. He was able to open folders, look at the contents, and remove files. Now, some of the folders that I have been invited to are the same ones that he has been invited to. For example, today he was editing a podcast that I am involved with. He and I already had access to that particular folder. He could access that one from his own computer. Surprisingly, he was also able to access folders that he had never been invited to. There is a podcast that I do with a friend of mine. That friend does the editing. My husband has no need to be invited to that particular folder. Even so, my husband was able to open that folder, look at the contents and remove files. He could have put files into that folder if he chose to do so. Typically, people are very careful about who they allow to access their computer. Admin status should never be given out on a whim. We only give that to people we trust. Before this little experiment, I had no idea that giving a person admin status to your computer also gave that person complete access to your Dropbox. For me and my husband, this isn’t really an issue. We trust each other. Our network is at home and secure. That being said, it made us both wonder about the potential risks involved with work computers that are accessible by multiple people within one company or business. Dropbox is perhaps the most widely-known and popular cloud storage service on the market though it is far from the only option. It faces stiff competition from the likes of Box, SkyDrive, Google, Amazon and others. In an effort to stay in front, the company has been releasing regular feature updates, and today brings the latest of those. The new sharing feature brings — now when you want to share a link to any doc, photo, folder, or any of your stuff in Dropbox, just right-click it, and select “Share Dropbox Link”. 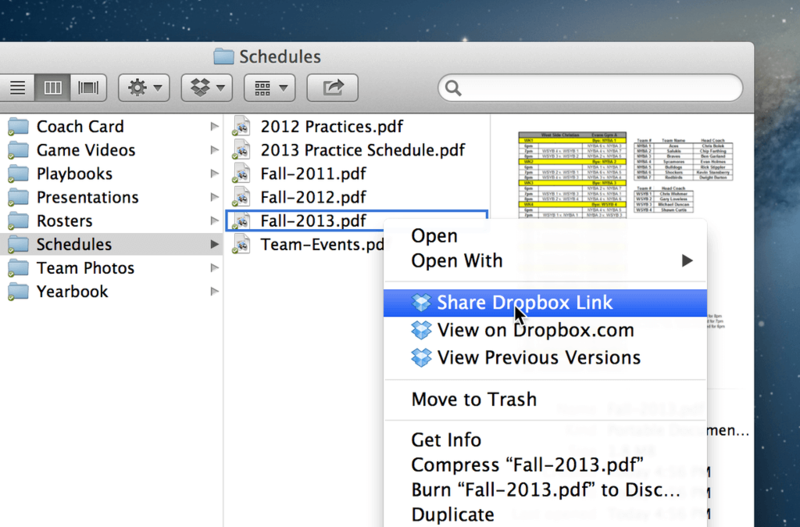 The new context menu displays an option for “Share Dropbox Link”. Just Control-v or Command-v to paste your link wherever you want, and you’re good to go. The update is quick and easy. Nothing complicated here, but it is a big edition in its own way. Is ti enough to keep the service ahead of its closest rivals? That remains to be seen.